One of the benefits of our upholstery cleaning service is that we deodorise the furniture in your home or business. If you don’t have these items regularly cleaned by a professional, they can start to release unpleasant odours from various materials that can become trapped inside them. Organic matter gives off molecules when it is decaying, which can cause strong and unpleasant smells to can build up in your upholstery. A deep clean is the only thing that can get rid of these types of odours. We focus on finding and removing the smells at their source. There are a wide variety of things that can be responsible for some of the stronger odours found in a business or family home. They can include pet urine, food, mildew, vomit, or mould. Obviously the first part of the deodorising process involves treating anything that we can identify as a direct source of the smell, but then we will probably use steam cleaning where we can to get a deep clean and completely remove the odour from your upholstery. Even ground in dirt, dust, and other debris that builds up over time can cause unpleasant odours. A damp or humid home or business may cause upholstery to smell over time. Asthma and other allergies such as hay fever can be exacerbated if these issues are not properly addressed. Deodorising can eliminate even the worst odours, leaving your upholstery smelling fresh and clean. 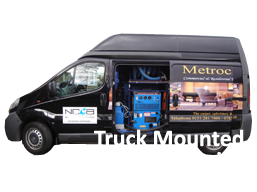 So, don’t think you just have to put up with nasty odours in your home or business, give MetroClean a call to see how we can help! Whether you run a small office or a large venue, our exceptional level of customer service and attention to detail remains the same. Give us a call on 0151 281 7466 today for a free quote!